If they’re going to be using your phone to pass the time, they may as well be playing good games. CONSIDERING HOW PREVALENT they are in our lives, it’s probably no surprise that kids are using smartphones more nowadays. For one, they’re incredibly handy at passing the time during long journeys or while you’re waiting for something and what better way to pass the time than to play games. Yet while it’s a handy option, you want to make sure that the games they’re playing are appropriate and fun, whether they’re using your phone or tablet or their own. If you’re unsure what games are a good fit, these will get you started. The franchise might be beginning to show signs of slowdown, but the original is still great fun to play. Simple to play, easy to learn and toppling structure and destroying them is still as satisfying as ever. Dots is an incredibly simple game yet manages to pack a lot of charm into it from the sounds each dot makes to the bright colours makes it both a joy and absolutely addictive. There is a sequel called TwoDots (iOS only), which is just as fiendishly difficult and addictive as the original, but it encourages you to pay for powerups and lives, meaning it’s probably not the best game for your child to play. One for the younger kids (4 – 10), Pet Bingo helps children learn about maths such as addition, subtraction, multiplication and division. It combines this with cute animal mascots which helps learning. Another simple premise but hard to master game, helping On-Nom get the piece of candy in each level starts off simple, but is quickly complicated by the inclusion of spiders, balloons, gravity and other obstacles that want to stop you. 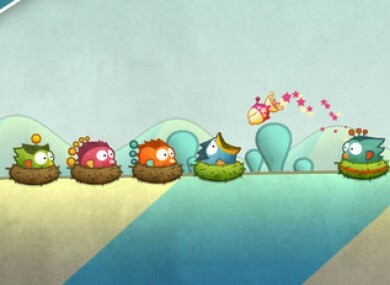 While it’s a lot of fun, it’s feels a little reductive to describe Tiny Wings a just a game. Instead, it’s a relaxing experience that anyone can enjoy. The bright visuals, simple mechanics, soft music and easygoing tone blends together to create a soothing experience. The tamagotchi-style game has you train your ninja and improve his skills as she looks for her lost friend. It’s slow-moving but the real fun is interacting with your ninja, giving him high-fives, picking him up and flinging him around the training area or even just tickling him (The latter is guaranteed to leave a massive smile on your face). If you ever played the lay the pipes games, then you will already know the drill with Flow Free. Connect the same colour dots without crossing different pipes and make sure you’re covering the entire board. The game might be a few years old but the magic that surrounds Minecraft hasn’t diminished. If you already own the console or PC/Mac version, then it’s likely you already have this but if not, this is a great way for them to become engrossed with the Lego-style mechanics as they survive the wilderness. Chances are you’re familiar with 2048 but if that’s the only one you’ve played, then you’re missing out on the game that inspired it. Not only is Threes! a marvellous puzzler, but it’s a game that’s full of heart. There are so many neat little touches in the game that it shows up 2048 for the cheap imitation that it really is. The tower-defence game pits your garden against the hoards of zombies that want to invade your house. Harvest sunlight, place different plants and fungi down and defend your house from a bizarre collection of the undead. Email “These are the best smartphone games for your kids”. Feedback on “These are the best smartphone games for your kids”.